Java quality management with Sonar part 1 | It`s full of stars! From an overview page a developer can drill down to the class to the actual source code where an issue is identified. As Sonar is a central server with permission control, a hierarchy and roles can be established like project owner, senior developer, developer, clients. Everybody can access the project and see or give feedback of the status and identified issues. Sonar can be used to established code guidelines in a project / company, help the developers to produce better and standardized code and used to show to the customer the quality of the code. The analysis of the code can be done by looking at the plain source code and use rules to identify violations of pre-defined best practices or by a more advanced analysis of the binary code. For the later findbugs is used. This gives more control over possible bugs that normally only will be discovered during runtime. As runtime means that the project has to be deployed, started and executed, any bug found by findbugs helps saving time. To make findbugs work, Sonar has to know where to find all the classes referenced in the byte code. If the class files are not available, the analysis won’t be executed. Run the analysis by using the source code on a PAR file for SAP Portal. Looks good, as no blocker or critical error is found. That code shouldn`t crash when executed with an exception. Analyzing the same code with a different profile: findbugs. Compared to the source code analysis, findbugs now shows 2 blockers and 2 critical bugs. Unlikely that the program won`t crash when executed. The issues found are more or less caused by the code generator of WDJ. In that case, Sonar helped to identify an error that only can be discovered after deploying the WDJ application. As that kind of error immediately occurs when the user is accessing the view and thus ending the test case, Sonar helps to resolve these kinds of errors faster. Sonar is for Java, but SAP interpreted Java sometimes in an interesting way; think of Web Dynpro Java. 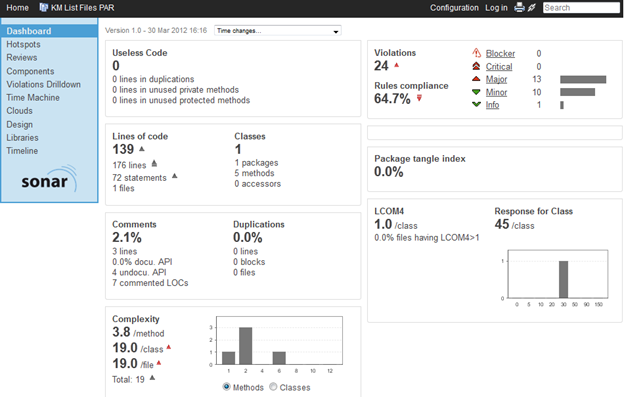 As shown, Sonar can be used to analyze all kinds of SAP Java projects. WDJ produces in the end . java and .class files, portal applications are Java projects and so is the rest of Java projects (like PI). Currently SAP is endorsing NWDI for Java development and while ABAP comes with a code inspector (you are using, right? ), there is no such solution from SAP for Java. If you want to get started with code quality management in Java for SAP, there are several solutions for Java available. To get started you can try Sonar. What is needed are accelerators, guidelines and plugins from SAP for their specific Java project types. That would really make a difference for developers. This entry was posted in Java, Technology and tagged code quality, sonar. Bookmark the permalink.